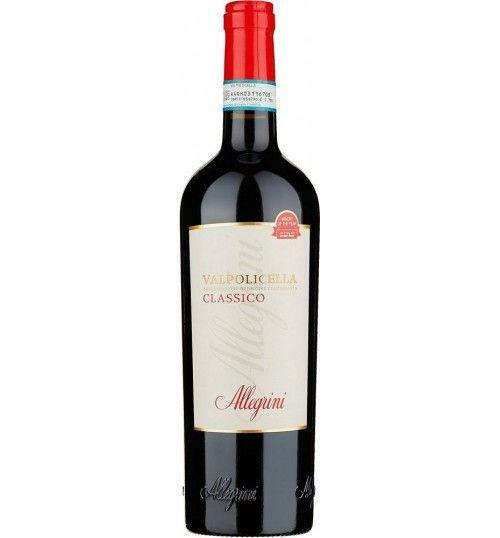 Valpolicella Classic by Allegrini, Corvina 65%, Rondinella 30%, Molinara 5%. A great classic tradition. Great balance and freshness are its most significant characteristics. It 'a red for all seasons, strictly vinified and left to mature in steel tanks sun. Snappy and juicy, balanced and relaxed, great taste delicacy. 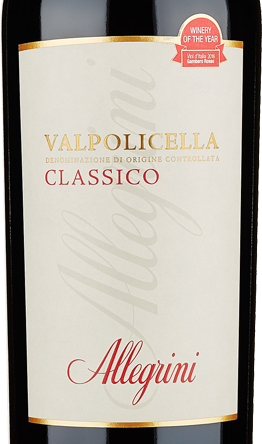 THE WINE Valpolicella Classic by Allegrini , Corvina 65%, Rondinella 30%, Molinara 5%. A great classic tradition. Great balance and freshness are its most significant characteristics. It 'a red for all seasons, strictly vinified and left to mature in steel tanks sun. Snappy and juicy, balanced and relaxed, great taste delicacy. THE FAMILY The Allegrini company may be considered the result of the intelligence and hard work of Giovanni Allegrini, who was a straight forward, instinctive man who built an agricultural concern that was solid, efficient and innovative. He started working at a very young age and perfected the art of wine-making with great skill and an all-encompassing passion. He was given the evocative nickname “the barrel spider” because in the cellar he would proudly invite guests to taste his wine, and whilst listening to comments and opinions, spring like a spider from one precious barrel to another. The life-style, history and culture of Giovanni still represent, today, the key to understanding the philosophy and reasons behind the success of Allegrini. After the premature death of Giovanni in1983, his three offspring took over the company and have run it ever since with impassioned enthusiasm and ever-increasing skill and competence. VALPOLICELLA AREA ACCORDING TO ALLEGRINI Love for the land has been the driving force behind the Allegrini family’s commitment to enhancing the potential of Valpolicella and its viticultural traditions. The far-sighted choices made by the company have made it one of the leading wine companies in Italy, and thus the new generation of wine-makers in Valpolicella look to Allegrini wines as an indisputable benchmark. The innovations introduced by Franco can be summarised in three main points: Gradual introduction of barriques used in tandem with traditional Slavonian oak barrels and, at the same time, a reduction in the ageing period so as to preserve the intrinsic flavour and aroma of the fruit. Revision of the consolidated technique of Ripasso: substitution of the pomace with a percentage of grapes dried using the appassimento method, so as to trigger a ‘second fermentation’ and confer a singular complexity to the wine as well as an elegant and well-balanced profile. A substantial modification to the appassimento method was achieved via the concept and creation of “Terre di Fumane”, a veritable ‘jewel in the crown’ of Valpolicella wine-making. Thanks to the ideas of Franco – supported by technical and scientific research – ideal conditions have been created for the drying and preservation of the grapes used to make Amarone and Recioto, thus guaranteeing high qualitative standards. After having explored ways of improving the local vinification techniques, Franco and his brother Walter also gradually introduced important innovations into the vineyards: they carried out wide-ranging experiments with the Corvina grape, which is the dominant variety in Valpolicella and one of the most interesting Italian autochthonous grapes. Its merits may be appreciated in La Poja, the company’s ‘cult’ wine made with 100%Corvina. Over time, the vine-training in the Family’s vineyards – the Trentino pergola (trellis) system, traditionally used in Valpolicella – was substituted by other systems to increase plant density. Finally, a densely planted vineyard was created using the international varietals Merlot, Cabernet Sauvignon, and Syrah in the flatlands of Villa Giona. Before 18,57 € tax incl. Tasting Color - ruby red with purple hues Scent - fragrant fruity dominated by cherry, fresh nuances of pepper and herbs Taste - from young to drink snappy and juicy, after a couple of years more gently. He started working at a very young age and perfected the art of wine-making with great skill and an all-encompassing passion. He was given the evocative nickname “the barrel spider” because in the cellar he would proudly invite guests to taste his wine, and whilst listening to comments and opinions, spring like a spider from one precious barrel to another. The life-style, history and culture of Giovanni still represent, today, the key to understanding the philosophy and reasons behind the success of Allegrini. After the premature death of Giovanni in1983, his three offspring took over the company and have run it ever since with impassioned enthusiasm and ever-increasing skill and competence. Love for the land has been the driving force behind the Allegrini family’s commitment to enhancing the potential of Valpolicella and its viticultural traditions. The far-sighted choices made by the company have made it one of the leading wine companies in Italy, and thus the new generation of wine-makers in Valpolicella look to Allegrini wines as an indisputable benchmark. The innovations introduced by Franco can be summarised in three main points: Gradual introduction of barriques used in tandem with traditional Slavonian oak barrels and, at the same time, a reduction in the ageing period so as to preserve the intrinsic flavour and aroma of the fruit. Revision of the consolidated technique of Ripasso: substitution of the pomace with a percentage of grapes dried using the appassimento method, so as to trigger a ‘second fermentation’ and confer a singular complexity to the wine as well as an elegant and well-balanced profile. A substantial modification to the appassimento method was achieved via the concept and creation of “Terre di Fumane”, a veritable ‘jewel in the crown’ of Valpolicella wine-making. Thanks to the ideas of Franco – supported by technical and scientific research – ideal conditions have been created for the drying and preservation of the grapes used to make Amarone and Recioto, thus guaranteeing high qualitative standards. After having explored ways of improving the local vinification techniques, Franco and his brother Walter also gradually introduced important innovations into the vineyards: they carried out wide-ranging experiments with the Corvina grape, which is the dominant variety in Valpolicella and one of the most interesting Italian autochthonous grapes. Its merits may be appreciated in La Poja, the company’s ‘cult’ wine made with 100%Corvina. Over time, the vine-training in the Family’s vineyards – the Trentino pergola (trellis) system, traditionally used in Valpolicella – was substituted by other systems to increase plant density. Finally, a densely planted vineyard was created using the international varietals Merlot, Cabernet Sauvignon, and Syrah in the flatlands of Villa Giona.